Let me lay it on the table: the top critics have praised “The Christians.” Christopher Isherwood of the New York Times called it “a mesmerizing drama … a terrific play.” The LA Times’ critic, Charles McNulty said, “This is a rare play about religion that both believers and nonbelievers can embrace.” Hilton Als of the New Yorker Magazine lauds playwright Lucas Hnath’s “sense of high drama, and … deep understanding of how the patriarchy wants to hold on to just that.” There is another possibility, however, that is that the emperor has no clothes. 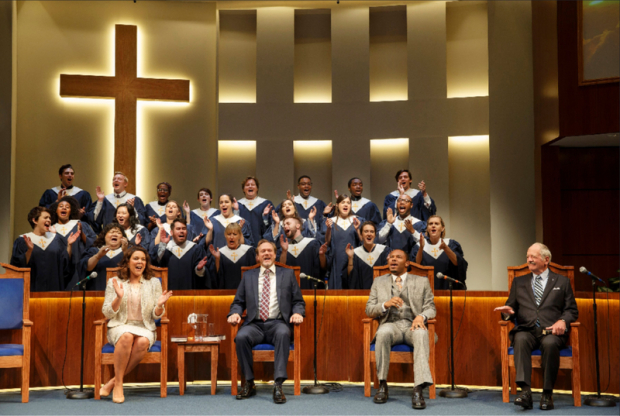 For this production the Mark Taper stage is the stage of a successful evangelical mega church with Sears-Roebuck-blue carpeting and a 31-member choir. They are flanked by two large flat screens with Hallmark card style inspirational imagery. The theater audience is the congregation. It is an effective, if off-putting, set by Dane Laffrey. Pastor Paul, a slightly smarmy Andrew Garman, addresses us through his microphone with good news; the mortgage that has funded all this plastic splendor has just been paid off thanks to the contributions of the dedicated flock. Now for body of the sermon: after a homey tale of how Paul met his wife, Elizabeth (Linda Powell), who is seated demurely behind him on the podium, he launches into his main message. It seems that while sitting on the toilet he recalled hearing a story at a pastors’ convention about a brave African youth who rushed into a burning store to rescue his young sister but burned to death himself as a result. The missionary who told the story bemoaned the fact that, despite his heroic deed, he would be condemned to an eternity in hell, as the youth had never been baptized; he would be another lost soul. Paul, still on the toilet, is troubled by his. He has a long conversation with his pal God who informs him that hell is here on earth and Satan is a mythical construct. Heaven is open to all comers (never mind the population explosion). Christianity is not the key. Paul announces he can no longer believe in hell so his is now a church that does not believe in the concept of hell. Lucas Hnath briefly studied theology with the intention of becoming a preacher. He spared not a word writing Paul’s lengthy, vain, and vacuous sermon. Designed as a humble tale – Paul having an epiphany on the toilet – Paul is anything but humble. His expectation is that as he is the patriarch of his church his parishioners will just fall in line after his prolonged exposition. He is the salesman who believes his own pitch. Not so. Associate pastor Joshua (Larry Powell) throws down the gauntlet saying he is leaving the church. Fifty parishioners follow him, then hundreds, ultimately thousands. Paul’s wife declares she is following them. Paul had consulted no one, not even her, before making his big pronouncement. The Board of Directors want him to go. They want the young hell fire and brimstone pastor Joshua to return. Much of the play is as cool as the blue carpet. Though only 90 minutes, frankly it drags. All dialogue is performed with hand held mikes. Though a positive feature for hard of hearing members of the audience … should I say congregation? …. it undermines intimate and dramatic sections. The stage does not really come alive until late in the play. Jenny (Emily Donahoe), a young parishioner, steps from the choir and expresses what many parishioners must be feeling. A single mother on food stamps, the church has fed her, clothed her and her child, and most of all given her a sense of community. Paul’s undermining of her faith is frightening. Her boyfriend has followed Joshua and thrown a series of questions at her that pastor Paul is unable to answer. Donahoe is an excellent actor. She projects an image of a sincere young woman who does not recognize her own strength. She accuses him of having waited until the mortgage is paid off to make the announcement of his change of faith. Her anguish is genuinely moving as is Joshua’s when the elders and the Board ask him to take over the helm. Hearing it through a handheld mike is not intimate. It is just peculiar. If there is no part of you that can imagine yourself as part of an evangelical community “The Christians” is hard to swallow. If Paul has come to the point of rejecting the idea that Satan is real, does he really believe that god is having a prolonged conversation with him? That heaven is any more real than hell? Doesn’t that part of the story come into question? If there is no hell, if everyone – even Hitler – is admitted to heaven what does that say about the evangelical devotion to Jesus? The anguish Paul appears to suffer is that of losing his followers and his wife. The last portion of “The Christians” comes to life. The handheld mikes do not help, but it becomes possible to connect with the various characters in their personal agony. “The Christians” is not a play that an unbeliever can easily embrace. Too bad, just as I started to see what all the praise was about, it was time for the final curtain.